An elevator is a platform, either open or enclosed, used for lifting people or freight to upper floors within a building. Elevators are a standard part of any tall commercial or residential building. In recent years, the introduction of the Federal Americans with Disabilities Act has required that many two-story and three-story buildings be retrofitted with elevators. Manually operated elevators were used for lifting freight in warehouses and manufacturing plants as early as the 1600s. The modern elevator is a direct descendant of a design first shown by Elisha G. Otis at the New York World's Fair in 1853. A notable feature of the Otis elevator, and the principal reason for its popular acceptance, was a safety device that immediately engaged and held the elevator in the event the hoisting cables broke. The first elevators were operated by steam power to turn the cable drums. In 1871, the first hydraulic elevators were introduced using water pressure as the source of power. At first the hydraulic rams were one-piece, which meant a hole had to be dug under the elevator shaft as deep as the elevator was to be high. Later multiple-section, telescoping hydraulic rams allowed shallower holes. In many cities hydraulic power for these early elevators was supplied by power companies which installed and maintained networks of hydraulic piping throughout the city. 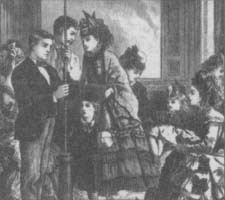 The first commercially successful electric elevator was installed in 1889, and electricity quickly became the accepted source of power. Electric-powered elevators offered two significant advantages. First, electric power was clearly becoming universally available, and any building likely to be equipped with an elevator would also have electric power. Second, hydraulic elevators were severely limited in the height to which they could rise, while electric elevators, using a simple cable and pulley system, had virtually no height limit. For many years, electric elevators used either direct current (DC) motors or alternating current (AC) motors. Today, almost all elevators use one of two types of AC motors: the most common are geared motors for elevators moving at speeds up to 500 feet per minute (153 m per minute), while direct-drive motors are used for elevators moving at higher speeds. Some modern high-speed elevators move at up to 2,000 feet per minute (610 m per minute). Control systems on early elevators required human operators to regulate the speed of the lift and descent, to stop the elevator at each floor, and to open and close the doors. In the 1950s automatic pushbutton control systems replaced manual controls. In the 1970s electromechanical controls were gradually replaced with solid state electronic controls. Riding in a small box hundreds of feet in the air would be a disconcerting experience if one were not convinced of its safety. Electric elevators are equipped with two primary safety mechanisms: a governor which controls the elevator's speed by controlling the speed of the cable pulleys, and the emergency brake which consists of jaws that grip the elevator guide rails in the event the cables break. Elevators also include electromechanical door interlocks to prevent the elevator from operating if the door is not completely closed and to protect passengers from being trapped by the closing door. The same door interlocks also prevent the outer doors on each floor from opening if the elevator is not present. Most elevators are equipped with a telephone, and sometimes a trap door in the ceiling, so that passengers can call for help or escape if an elevator becomes stuck between floors. Elevators themselves are simple devices, and the basic lifting systems have not changed much in over 50 years. The control systems, however, have changed sub-stantially to improve safety and speed of operation. Elevators are designed for a specific building, taking into account such factors as the height of the building, the number of people traveling to each floor, and the expected periods of high usage. Most elevators use counterweights which equal the weight of the elevator plus 40% of its maximum rated load. This counter-weight reduces the weight the motor must lift and ensures that the elevator cannot fall out of control while the cable is intact. In a lifting drum installation, a hoist cable runs down from a drive drum attached to the hoist motor, around a large pulley on the top of the elevator, up to a second pulley hanging from the roof of the elevator shaft, and down again to the counterweight. In a traction drum installation, the cable runs from the elevator, up and once around a drive drum attached to the hoist motor, then back to the counterweight. The elevator, called the car, and the counterweight each run in their own sets of guide rails. A second governor cable runs from the car up to a governor pulley, then down to a tension pulley at the bottom of the elevator shaft, and up to the car again. This cable rotates the governor pulley at a speed directly proportional to the speed of the car. In the event of excessive car speed, the governor uses another cable to activate the emergency brake jaws which grip the guide rails and slow the car to a stop. A ramped bar on the side of the elevator shaft activates a series of switches on the outside of the car to slow and stop the car at the proper floor. As the car approaches the desired floor, the ramp activates the slow-down switch, which signals the hoist motor to reduce speed. When the car is aligned with the outer door opening, the ramp activates a limit switch to stop the car. If the door interlock switches also sense that the car is in the proper location, the electric door opening motor is activated to open both the inner car door and the outer floor door. Modern commercial buildings commonly have multiple elevators with a unified control system. The object of the control system is to minimize the average time any passenger spends from the time the elevator call button is pushed to the arrival of the first available elevator. Different systems use different levels of sophistication. The simplest systems use a single up and down button on each floor regardless of the number of elevators. When a passenger calls for an elevator, the controller sends the nearest elevator that is traveling in the desired direction. The approach of an elevator car is signaled by an illuminated arrow above the elevators doors pointing up or down. In more sophisticated systems, the controller monitors the elevator call system for a set, or bank, of elevators operating side by side. The operation zone of these elevators is divided into sectors, with each sector being made up of adjacent floors. When a car has answered a call and completed the designated run, it becomes available to answer another call. At this point, depending on the controller's programming, the car may be returned to a designated "home" floor, or may be sent to the sector furthest from other operating or available cars to cover that sector. When a call is received, the controller automatically compares the location of all the cars in the bank and sends the nearest one. Controllers can also be programmed to respond differently at different times of the day. For example, the elevator controller in a busy office building will receive a preponderance of calls from the ground floor in the morning, when workers are arriving and need to go to their workplaces on the upper floors. In that case, the controller will be programmed to send all unassigned cars to the ground floor, rather than have them return to a home floor in their sector. Later in the day, a different set of instructions can be used to send unassigned elevators to different sectors, since passengers leaving the building will be much more evenly distributed among the floors than in the morning. All modern elevators also have special override controls that firefighters can activate with a key to make elevators go directly to a specific floor without intermediate stops. The elevator car itself is constructed with a steel framework for durability and strength. A set of steel beams above the car, called the crosshead, span the elevator shaft from side to side and hold the pulley for the hoist cable. A steel structure, called the sling, extends down the sides of the car from the crosshead and cradles the floor, or platform. The sides of a passenger elevator car are usually made from steel sheet and are trimmed on the inside with decorative paneling. The floor of the car may be tiled or carpeted. Handrails and other interior trim may be made from stainless steel for appearance and wearability. A suspended ceiling is usually hung below the actual top of the car and may contain fluorescent lighting above plastic diffuser panels. The elevator controls, alarm buttons, and emergency telephone are contained behind panels in the front of the car, next to the doors. Steel guide rollers or guide shoes are attached to the top and bottom of the sling structure on each side to run along the guide rails. The guide rails are also steel and are attached to the interior walls of the elevator shaft which runs from the top of the building to the bottom. The emergency brake mechanism consists of two clamping faces which can be driven together by a wedge to squeeze on the guide rail. The wedge is activated by a screw turned by a drum attached to the emergency cable. The elevator in the new Lord and Taylor department store in New York City looked like this on opening day in 1873. The elevator is one of those inventions whose "ripple effect" is often overlooked. Just think of the practicality of any building over eight or ten stories without an elevator. Then imagine a modern city without buildings over ten storiesl Along with structural steel and reinforced concrete, the elevator was essential to the development of the modern skyscraper and thus to the common form of the modern urban center. The elevator's practical impact was almost matched by its symbolic impact. The 1880$ were years of immense urban growth, and the influx of newcomers to the cities included middle-class career people as well as factory workers. With property values skyrocketing in the cities, the middle-class families could not afford single family homes. Apartment building owners promoted apartment living with advertisements of "high-tech" amenities: hot and cold running water, telephone systems, central gas for cooking and lighting, fully equipped bathrooms, and elevators. Moreover, with all these modern conveniences, apartment living captured the middle-class imagination as the embodiment of a new organization of domestic duties. Buildings came with centralized heating, ventilating, and plumbing systems; some had kitchens in the basement which would prepare food for individual apartment dwellers; some even had a centralized vacuum system with nozzles in each room connected to a pump in the basement. The elevator was even extolled as a contributor to democracy. In an elevator-equipped building, it mode little difference which floor one lived on; every floor was equally accessible. By contrast, in Europe, wealthy families were generally found on the middle floors where they did not have to climb many flights. Poorer families were usually confined to the basement or the upper floors. Elevator hoisting cable usually consists of six or more strands, each of which consist of a number of separate steel wires. The strands may be twisted around a hemp center which serves as a cushion and also contains a lubricant. 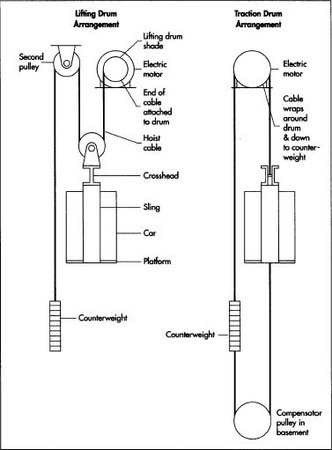 In a lifting drum installotion, a hoist cable runs down from a drive drum attached to the hoist motor, around a large pulley on the top of the elevator, up to a second pulley honging from the roof of the elevator shoh, and down ogoin to the counterweight. In a troction drum installotion, the cable runs from the elevotor, up and once around a drive drum attoched to the hoist motor, then bock to the counterweight. The electric hoisting motors are specifically designed for elevator service and may drive the hoisting drum through a gearbox, both of which are purchased parts. The elevator cars are built at the elevator manufacturer's plant using standard metal cutting, welding, and forming techniques. If the cars will be exposed to the weather during building construction, the interior trim may be installed after the building is finished. 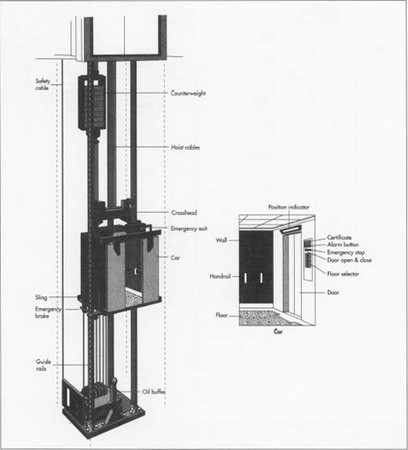 Most elevators use counterweights which equal the weight of the elevator plus 40% of its maximum rated load. This counterweight reduces the weight the motor must lift and ensures that the elevator cannot fall out of control while the cable is intact. other dimensions are carefully monitored as each floor goes up. Guide rails, switch ramps, service ladders, and similar support equipment are bolted into the shaft after the shaft walls are complete, but before the shaft is roofed. While the shaft is still open at the top, a crane raises the counterweight to the top of the building and lowers it into the shaft along its rails. The crane then lifts the elevator car and inserts it partly into the shaft. The guide wheels connect the car to the guide rails, and the car is carefully lowered to the bottom of the shaft. The shaft is then roofed over, leaving a machine room above the shaft. The hoist motor, governor, controller, and other equipment are mounted in this room, with the motor located directly over the elevator car pulley. Each elevator installation in the United States must meet the safety standards of the American National Standards Institute and the American Society of Mechanical Engineers. These standards may be incorporated into local building codes, or the local codes may have their own safety standards. The state must inspect, rate, and certify each passenger elevator installation before it goes into operation and must reinspect on a regular basis thereafter. Elevators have not changed substantially in many years and are unlikely to do so in the near future. Electronic controls will continue to improve in ways that are evolutionary and not very dramatic. Control systems are being developed that will learn from past traffic patterns and use this information to predict future needs in order to reduce waiting times. Laser controls are coming into use, both to gauge car speed and distance, as well as to scan building floors for potential passengers. Elevator Technology. Published for the International Association of Elevator Engineers by Ellis Horwood. Halsted Press, 1986. Ford, Barbara. The Elevator. Walker and Company, 1982. Evans, Barrie. "Fuzzy Logic for Smarter Lifts." Architect's Journal, May 18, 1994, pp. 24-25. Richards, Kristen. "Design Files." Interiors, February 1991, pp. 22-23. I felt the explaination given in this article was very useful for novice like me in the elevator business... thanksa lot for the overview of history of elevators and also the mechanism of its function. I was thinking to go in for a home made economical lift system. This article provided me 95% of the knowledge that is required for my purpose. It is quite an example of how lucid an article can be in simple language but at the same time covering all the criticalities. Thank you. I got the confidence to go ahead and can get that 5% knowledge while practically building on it.